The first trilogy created exclusively for Swarovski SCS members was the ‘Caring and Sharing’ trilogy. The series of 3 figurines consisted of the Swarovski Lovebirds, Swarovski Woodpeckers, and Swarovski Turtledoves. These figurines were available for a single year only, the Lovebirds in 1987, the Woodpeckers in 1988, and the Turtledoves in 1989. The Caring and Sharing Plaque (with no reference to language) is known by SCPCSNR1 in the popular Swarovski book Warner’s Blue Ribbon Books on Swarovski. 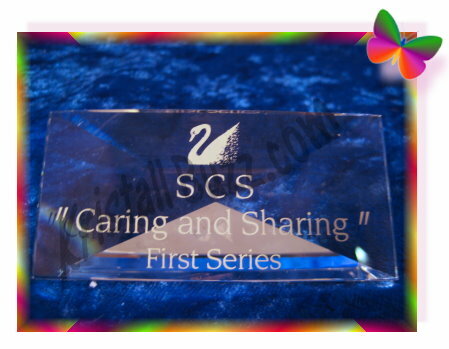 The Swarovski Caring and Sharing plaque originally retailed for just $28. It was packaged in a white cylinder. Today, this plaque generally sells $140 – $250 on the secondary market. If you have the Caring and Sharing series and desire to have the plaque to display with your crystal figurines, the plaque can be found at the Crystal Exchange America web site in the SCS category, sub-category Plaques and Stands. Swarovski Turtledoves Stand for the 1989 AE Swarovski ‘Amour’ Turtledoves What is the Dot by the Swarovski Swan Logo on Crystal Figurines?